1. Combine ginger garlic paste, salt and pepper powder in a bowl. 2. Marinate the chicken pieces in this for 20 to 30 minutes. 3. Combine all the other ingredients, except oil, in another bowl. 5. Skewer the chicken cubes and roast in a preheated oven/tandoor for 5 minutes at 140C/275F. 6. Remove and drain off the excess marinade by hanging the skewers. 7. Brush the chicken pieces with oil and roast again for 2 to 3 minutes. 8. Remove the chicken pieces from the skewers and transfer them to a plate. 9. Garnish with coriander leaves and lemon wedges. 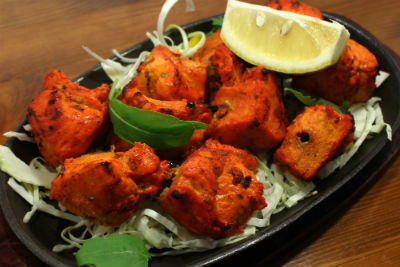 Feel free to comment or share your thoughts on this Murgh Malai Tikka Recipe from Awesome Cuisine.